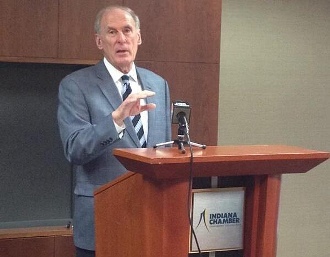 Senator Dan Coats was in the Indiana Chamber of Commerce office today promoting the bill he introduced — the Sound Regulation Act of 2014, to help Hoosier job creators. The bill would require every federal agency to engage in an extensive cost-benefit analysis to determine the actual cost, in dollars, of regulations under each agency’s jurisdiction. According to the U.S. Small Business Administration, the cost of complying with federal regulations exceeds $1.75 trillion every year, which amounts to more than $10,500 per American worker. Meanwhile, the number of pages in the Code of Federal Regulations has expanded from 71,224 in 1975 to 174,545 in 2012. The aim of the bill is to reduce over regulation on American businesses — an effort the Chamber supports. Here’s more on the bill from Sen. Coats’ web site. This entry was posted in Business News, Chamber News, Government and tagged dan coats, regulation, sound regulation act by Indiana Chamber of Commerce. Bookmark the permalink.